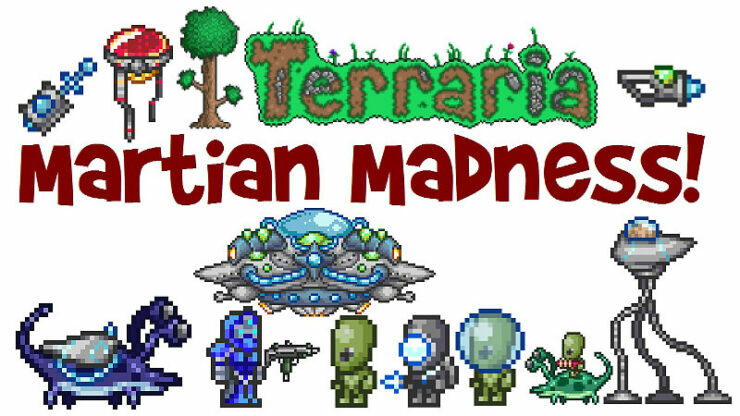 This guide explains the Martian Madness event in Terraria. This took me WAY too long to make. (almost 2 months) I need to start working on guides more. So, you want to fight the Martian Madness? You may want to prepare. Note that like Goblin invasions, it can only be fought in the center third of your world. If you already have an arena for Goblin / Pirate invasions, it will work with Martians, too, BUT you may want to add on to it to fight the Martian Saucer, the miniboss of the event. I suggest a shield format above your head (as demonstrated in picture below). Now that you have an arena set up, now how do you summon this event? Simple, head to the outer thirds of your world (near ocean will do) and fly up into space. A good place to wait is on a floating island. If you have the Depth Meter, make sure it says you are in space and you hear the space music play. 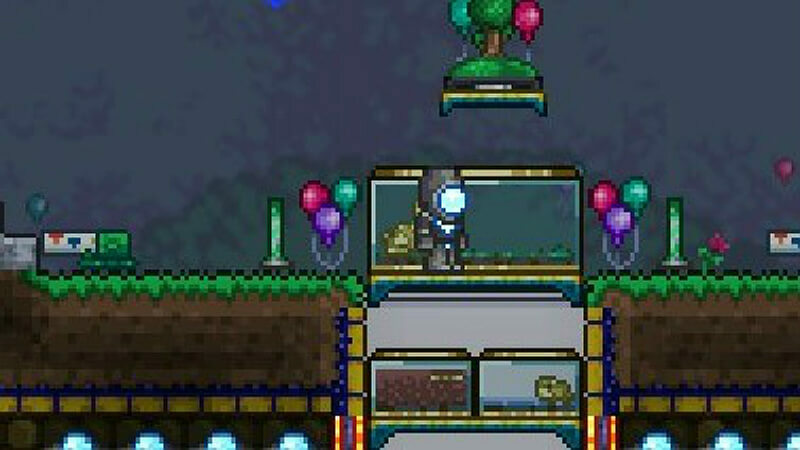 If you have the Lifeform Analyzer (check my cell phone guide on that) if it says Martian Probe, or you see a Martian Probe, go into its green zone and let it escape to summon the event. Then it will say in purple that Martians are invading! Note that you can not fight the Martian Madness until after Golem is defeated. Now warp back to your arena and stand below your shield. A weapon with range, like a yoyo or magic weapon can be used to kill the normal mosters below, or if your arena has lava, let that kill the martians. 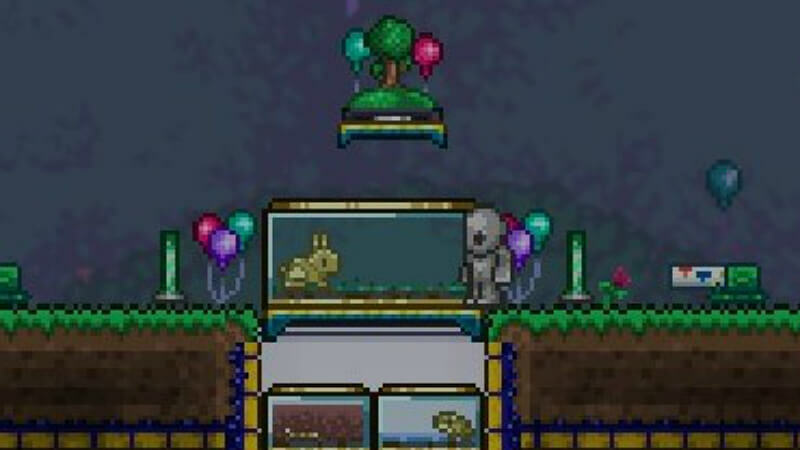 After some progress a Martian Saucer will spawn. This is where the shield comes in handy, as it can block most of the saucer’s attacks, and you can either use a yoyo or jump out to attack the saucer. Several saucers will spawn over the course of the event. Once killed the saucer will drop a special drop. Use ranged, magic, or ranged melee (yoyos, Terra Blade, etc.) 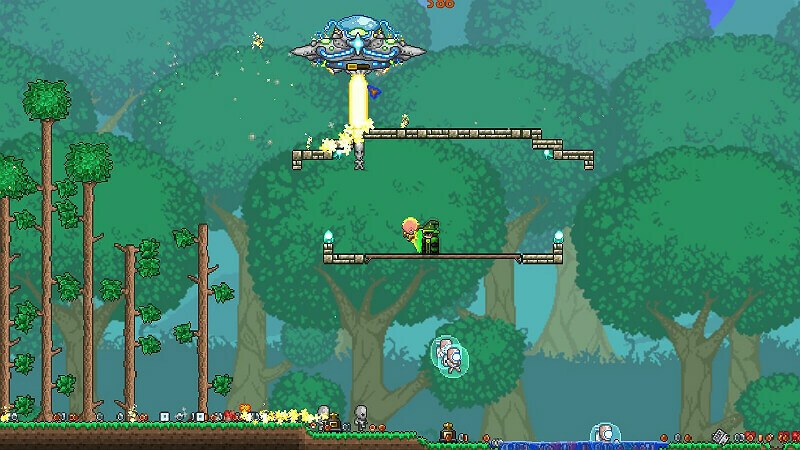 weapons and have some block shields to protect yourself from the other Martian enemies. The Saucer drops good loot but can be very damaging, so I suggest killing the saucers first. Once the progress bar in the bottom right reaches 100% it will say in purple “The Martians have been defeated!” and the event will end. The regular enemies drop martian Conduct Plating, a building block that can also be used to craft martian furniture. The Scultix Gunner enemy can drop the Brain Scrambler item, which summons a Scultix mount that has a speed of 40 MPH and can jump 14 tiles (28 ft) high. It will also reduce fall damage down to 1. It also fires lasers that deal about 100 damage, and liquid traversal accessories like the Lava Waders and jump accessories like the Cloud in a Bottle will be functional while on the Scultix. Also, the normal Martians drop the Martian Costume and the Martian Uniform vanity outfits, in case you like being a martian. The Laser Machinegun is a magic weapon with an 11% drop rate from the Martian Saucer and deals 60 base damage. It takes 2 seconds to charge up before reaching full speed, similarly to the Last Prism. The Xenopopper is a ranged gun weapon that has a 11% chance of dropping from the Martian Saucer miniboss, and deals 45 base damage. 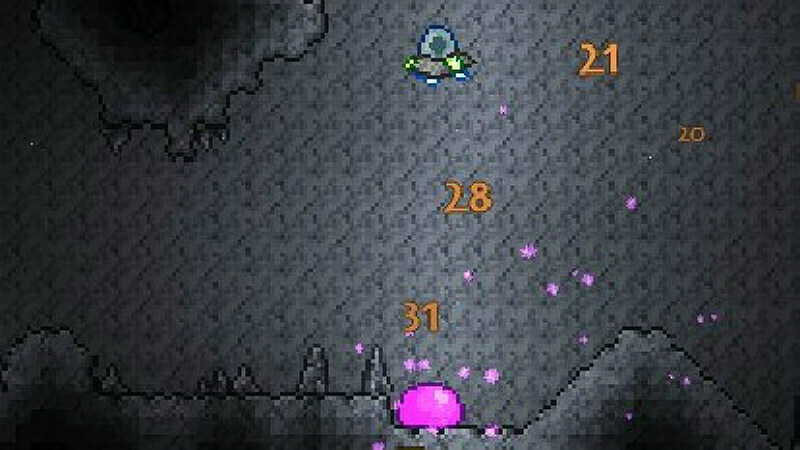 When used it shoots 4-5 bubbles, which pop and shoot 1 bullet per bubble towards the cursor. It only consumes 1 ammo per shot, so you get 4-5 shots per bullet! 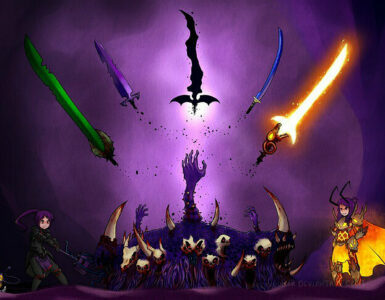 The Xeno Staff is a summoner staff that summons a UFO, which will shoot lasers at enemies. It deals 36 base damage. 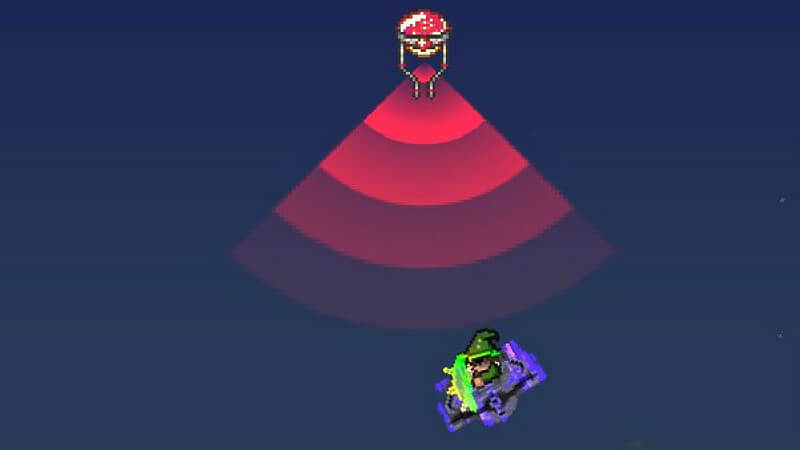 In spaces with low ceilings, the UFOs are ineffective due to their AI of hovering several blocks above the enemy and shooting, and they can’t shoot through blocks, so other weapons should be used in confined areas like tunnels. The Cosmic Car Key summons a UFO mount that allows you to fly and hover indefinitely. It will not work in liquid, and if the player goes into any liquid, they will be dismounted. If you need a indefinite flight mount that works underwater, the Cute Fishron is a good alternative. It goes 41 MPH while flying, but when going diagonally, it can go up to 58 MPH. 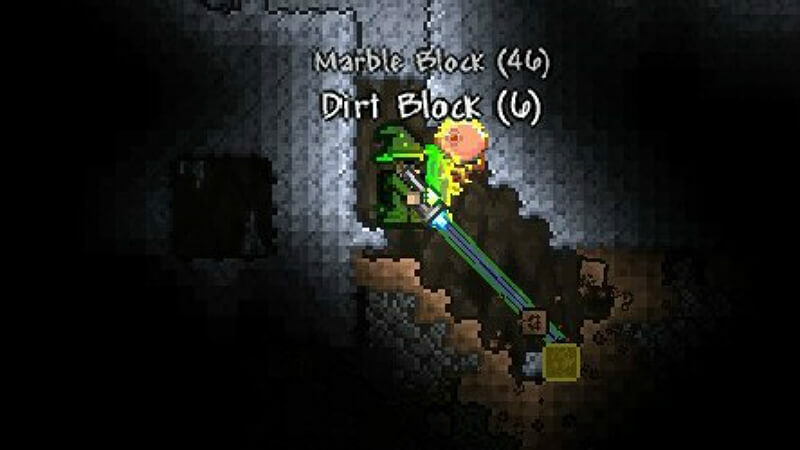 The Laser Drill is a drill with 230% pickaxe power and 150% axe power, the highest of any frill or chainsaw in the game. It had +10 range over normal tools making it good to reach far away areas. It isn’t very effective because other pickaxes at its tier, like the Luminite Pickaxes, are much faster, making the Laser Drill irrelevant. 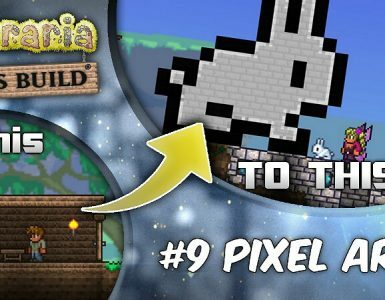 However, its ridiculously long range can help with Plantera allowing you to break the bulb and be closer to your arena. 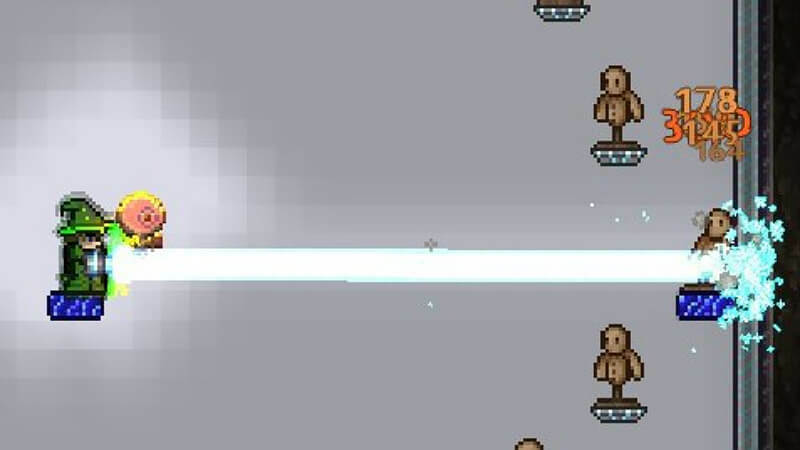 The Charged Blaster Cannon is a magic weapon with a 11% chance to drop from the Martian Saucer and 52 base damage. As the name suggests, it can be charged up to deal more damage. Tapping the use button will shoot a single, non-piercing blast. Charging it for one second releases a larger blast with infinite pierce and increased damage. Holding it for more than three seconds shoots a large, continuous beam that fires for 5 seconds or until mana is depleted. Note that the beam on full charge cannot be adjusted while it fires. Yeah, there’s quite a bit of loot! The Electrosphere Launcher is a rocket launcher that deals 40 base damage and has an 11% chance to drop from the Martian Saucer. When used, it shoots a rocket towards the cursor that when it reaches the location of the cursor, or any block or enemy in the way, it will explode into a ball of electricity that lasts for 8 seconds, dealing damage for the time that is is out. Different kinds of rockets do not affect the blast radius, however they affect the damage. The Influx Waver is a sword that has an 11% chance to drop and deals 110 base damage. When swung, it shoots a beam similar to the Terra Blade, however, upon contact the beam may reappear up to two more times to strike a nearby enemy. 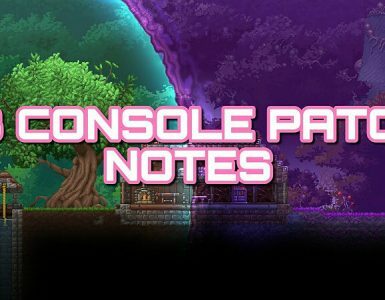 The reappearing beams will not home in on a teleporting enemy like the Necromancer if it teleports before the extra beams can strike, nor will it target critters. 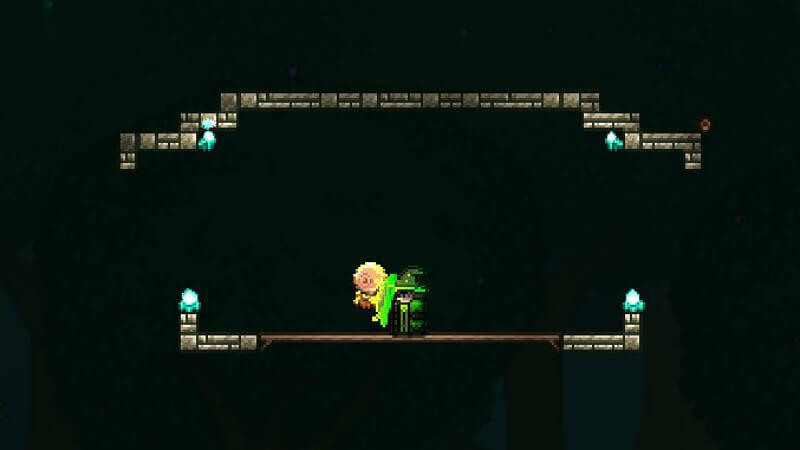 The Anti-Gravity Hook is a grappling hook that reaches 31 tiles and can have up to 3 hooks out at once. WIth one grappled, you can orbit around the latch point with the movement keys, however the movement is more limited with multiple hooks out.